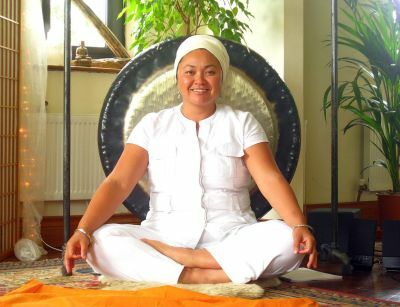 The healing sounds consist of gong improvisations. in a more harmonious and peaceful vibration. To get a beneficial effect it is important to listen with a good sound system. Computer speakers will not do! Improvising music for me is a way of digesting all sorts of impressions which have accumulated in the past. By singing, playing the singing bowls and the drum I experience an enormous field of possibilities towards entering hidden, non-verbal dimensions. In my work as a psychotherapist it is of essential importance. It helps my clients to release old pain and memories and thought patterns attached to it. After a sound healing which can vary in length from a minute to half an hour, there is an immense feeling of relieve. It can be accompanied by crying loudly, sighing, or soft tears that fall gently. And then there is room to receive sounds which generate the deep knowledge of being loved without condition. Sound healing opens us to healthy, open, loving beautiful and innocent visions of a life in peace. This also enables myself and my clients to become aware of so many beautiful gentle helpers and teachers from the spiritual domain, who are so willing to help us grow! I’m always moved by their accurateness and gentleness. Of course memories come up of dear ones, who have gone over to other dimensions, a child, a parent, a grandparent, brother, sister, a dear friend. After the sound healing the sense of loss can be digested more fully. Through conscience remorse the contact from heart to heart can be restored. It is my believe that the contact with loved ones is THE ONE that binds us all and that can last through ages and dimensions. This feeling is so immense and great that it gives me a sublime JOY to speak, write and sing of it! When I improvise on the piano I take myself on journeys, I don't know where to. It is all an adventure, a fairy tale if you like, with scary and bad moments as well as happy and heart moving moments. This is why I give no title to any of my music pieces. I play and or sing and the listener makes up their own experiences through it. So my advise is to simply listen without any intention of expectations. Allow yourself to be invited by the power of the music itself.